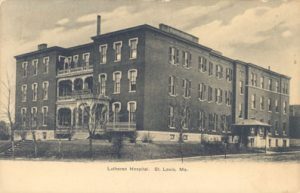 The Alumni Association of the Lutheran School of Nursing, St. Louis, Missouri, was founded in 1905. Our centennial celebration was held in 2005. While much has changed over the years, the two functions most valued by our members are the Annual Reunion, which is held the first Saturday in August, and the Annual Bulletin, which is prepared during the spring and summer with a planned distribution by mail prior to Thanksgiving. Other functions include hosting luncheons for the new LSN graduates during the week prior to the June or November graduation. At our Annual Business Meeting, a Memorial Moment is held for our colleagues who have passed away during the previous year. The Alumni LSN has about 700 members who live across the United States and in other countries. There are addresses known for about 1,850 graduates; we welcome more information. Over 4,000 RNs have graduated from the Lutheran School of Nursing, a diploma nursing program, which has been in existence since 1898; LSN is fully accredited and remains housed on the Jefferson Campus of Saint Alexius, whose hospital is located on their Broadway Campus.